The Fiji media are gathering today for a close up look at the interim government's new media decree, which will supposedly pave the way for the public emergency regulations to be lifted. Today's discussions come as local media contend with a decision by the Australian owned and managed, Fiji Times newspaper, to step out of its comfort zone to air its concerns about the decree. The story was headline news after the attorney general, Aiyaz Sayed-Khaiyum, yesterday called a special press conference to question comments by the Times publisher and managing director, Anne Fussell. The Sun says Ms Fussell is the Fiji representative of Fiji Times owner News Limited, Australia’s most powerful news-paper company, acknowledging its efforts to get comment from her were unsuccessful. It said staff told it Fussell was the only one who could comment but refused to give her phone contact and that an email to her remained unanswered when it went to press. It added that Ms Fussell arrived from Australia to be publisher and managing director of The Fiji Times early last year. This came after both her two predecessors, Australians Evan Hannah and Rex Gardner (pictured above packing up in January, 2009), were ordered out by the Government. The coverage by Fiji Live was more reserved with the team going with the headline "AG questions newspaper's motives" and the line "Fiji’s oldest newspaper the Fiji Times has come under criticism from the government one day before consultations begin on a draft media decree." It had Sayed-Khaiyum saying the one day allocated for consultations would be enough with copies of the decree released at 8am and consultations beginning at 10.30am . Neither took the opportunity to endorse Fussell's call for the interim government to be more reasonable with the time it was allowing stakeholders to make submissions and neither did they question the overall intent of the new media decree. With the departures of earlier publishers and editors, it's not the first time the Fiji media have had to report on one of their own since the Bainimarama government took power but it's hoped they - and other stakeholders - are more assertive in today's discussions and submissions. This is, after all, the last chance they may get to shape the news, legitimately. You're right, old son. 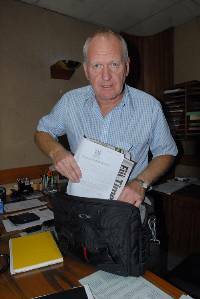 Russell Hunter was Fiji Sun and Rex Gardner, Fiji Times. That sentence was a direct lift from the Sun.C4 Ed.